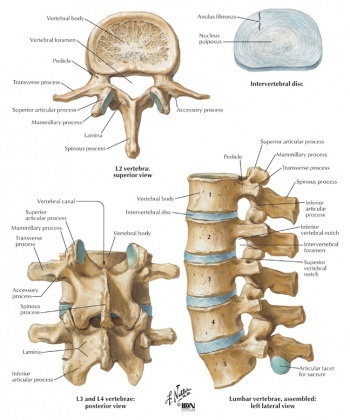 The Lumbar Vertebrae are larger and heavier than vertebral bodies in other regions. The lumbar vertebral body is kidney shaped when viewed superiorly, so is wider from side to side than from front to back, and a little thicker in front than in back with a thin cortial shell which surrounds cancellous bone. The posterior aspect of the vertebral body changes from slightly concave to slightly convex from L1 - L5 with an increasing diameter due to the increased load carried at each body. The main weight of the body is carried by the vertebral bodies and disks. The lamina, facets and spinous process are major parts of the posterior elements that help guide the movement of the vertebrae and protect the spinal cord. The vertebral foramen is triangular in shape and is larger than in the thoracic vertebrae but smaller than in the cervical vertebrae. The pedicles originate posteriorly and attach to the cranial half of the body forming the vertebral arch with the laminae. The pedicles become shorter and broader becoming more lateral from L1 - L5 which narrows the anteroposterior diameter and widens the transverse diameter of teh vertebral canal. Forming the Vertebral Arch with teh Pedicles the each laminae is flat and broad blending in centrally with the spinous process. The spinous process are short and sturdy in teh Lumbar Vertebrae often described as "Hatchet-Shaped". The transverese process are long and slender in the Lumbar Vertebrae with accessory processes on teh posterior surface on the base of each process. The superior articluar facets which are directed posteromedially or medially while the inferior articular facets are directed anterolaterally or laterally with a mamillary process on posterior surface of each superior articular process. Developmental:Spondylolisthesis, Scoliosis, Hypermobility, Various uncommon disorders. Inflammatory arthropathy: Ankylosing spondylitis, Rheumatoid arthritis, Reiter´s disease, Ulcerative colitis, Crohn´s disease, Psoriasis. Isometric tests in the lumbar area produces considerable intervertebral movement. It may be necessary to test the muscle isometrically in differents positions of the joint range and to compare the degree of pain produced by an active resisted movement with that of a passive movement. Lumbar spine radiography is often performed instead of CT for radiation dose concerns. In a study which compares radiography with CT, radiography scored better on sharp reproduction of cortical and trabecular bone. Other study showed that radiography is likely to be cost-effective only when satisfaction is valued relatively highly. Therefore, strategies to enhance satisfaction for patients with low back pain without using lumbar radiography should be pursued. Conceptual links between MRI findings and spine-related symptoms. Primary MRI predictors of interest on italic. MR for new low back pain is of little value in making a diagnosis based on specific spinal pathoanatomic changes. With respect to chronic low back pain or radicular symptoms, MRI findings does not explain the vast majority of incident symptom cases. Lumbar Fusion: The goal of a lumbar fusion is to stop the pain at a painful motion segment in the lower back. Most commonly, this type of surgery is performed for pain and disability caused by lumbar degenerative disc disease or a spondylolisthesis. Manual mobilisation: Physiotherapists use manual mobilisation for differents patologies of the lumbar spine. Good knowledge of the appropriate technique is needed as well as take into account some contraindications, for example, high velocity spinal manipulation techniques are contraindicated in individuals with osteoporosis. Postural taping uses tape applied to the skin to provide increased proprioceptive feedback about postural alignment, improve thoracic extension, reduce pain and facilitate postural muscle activity and balance. ↑ Moore KL, Agur AM; Dalley AF. Essential Clinical Anatomy. Philadelphia: Lippincott Williams; Wilkins, 2011. ↑ Ombregt, L. Applied Anatomy of the Lumbar Spine. Chapter 31 In: A System of Orthopaedic Medicine. Elsevier, 2013. ↑ 4.0 4.1 G.D. Maitland. Vertebral Manipulation. Fourth Edition. London-Boston: Butterworths, 1977. ↑ 5.0 5.1 Alshamari M, Geijer M, Norrman E, Lidén M, Krauss W, Wilamowski F, Geijer H. Low dose CT of the lumbar spine compared with radiography: a study on image quality with implications for clinical practice. Nordic Society of Medical Radiology 2016; 57. ↑ Miller P, Hendrik D, Bentley E, Fielding K. Cost-Effectiveness of Lumbar Spine Radiography in Primary Care Patients With Low Back Pain. Spine 2002; 27:2291-2297. ↑ Barr J, Barr M, Lemley TJ, McCann RM. Percutaneous Vertebroplasty for Pain Relief and Spinal Stabilization. Spine 2000;25: 923-928. ↑ Krause M, Refshauge KM, Dessen M, Boland R. Lumbar spine traction: evaluation of effects and recommended application for treatment. Manual Therapy 2000; 5:72-81. ↑ McNeely ML, Torrance G, Magee DJ. A systematic review of physiotherapy for spondylolysis and spondylolisthesis. Manual Therapy 2003; 8:80-91. ↑ Li WC, Chien YC, Yang RS, Tsauo JY: Effects of exercise programmes on quality of life in osteoporotic and osteopenic postmenopausal women: a systematic review and meta-analysis. Clin Rehabil. 2009, 23: 888-896.